Our studies aim at controlling the organization of conjugated (macro)molecules (oligomers and polymers) at the nanoscopic/microscopic level through supramolecular design and engineering and thin film deposition protocols. The main driving forces for achieving nanoscale ordering are: i) self-assembly processes involving p-p interactions and/or hydrogen-bonding (for instance, using bio-inspired and DNA templating): ii) nanophase separation in “rod-coil” block copolymers; iii) thin films patterning approaches for (nano)structuring conjugated materials (including nanorubbing and soft-lithography techniques). Our studies are aimed at understanding the relationships between the molecular architecture, the nanoscale morphology and the optoelectronic properties for light-emitting devices, field-effect transistors, and organic photovoltaic diodes. We also work towards the development of novel SPM approaches for the nanometer scale characterization of the electrical and mechanical properties of organic materials. Right: Molecular model showing the supramolecular organization of conjugated oligomers (in blue) templated by a single-stranded DNA (in red) (M. Surin et al). 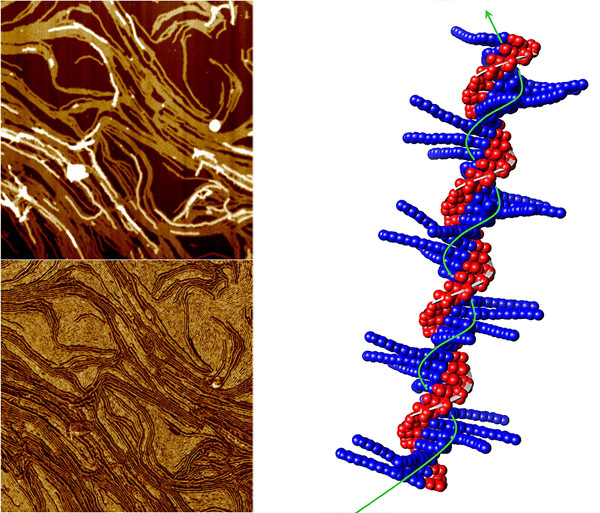 On the Transfer of Cooperative Self-assembled pi-Conjugated Fibrils on a Gold substrate: the Role of an Early Formed Monolayer. M. Wolffs, M. Malisauskas, I. De Cat, Ž. Tomovic, J. van Herrikhuyzen, C.M.A. Leenders, E.J. Spadafora, B. Grévin, S. De Feyter, E.W. Meijer, A.P.H.J. Schenning, and Ph. Leclère.Chemical Communications 47 (2011), 9333 – 9335. Journal of Physical Chemistry C, 115 (2011), 10550-10560. Thermally Induced Coupling ofPoly(thiophene)-Based Block Copolymers Prepared by Grignard MetathesisPolymerization: A Straightforward Route Toward Highly Regioregular MultiblockConjugated Copolymers. F. Ouhib, S. Desbief, R. Lazzaroni, J. De Winter,P. Gerbaux, C. Jérôme, C. Detrembleur. Poly(3-alkylthiophene) with TuneableRegioregularity: Synthesis and Self-Assembling Properties. P.Willot, J. Steverlynck, D. Moerman, P. Leclère, R. Lazzaroni, G. Koeckelberghs.